Dollar sales in February experienced an expected seasonal improvement of 22% to $200,563,499 from January’s $163,769,334, up by 18% over last February’s of $169,452,699. The increase over last year in the last two months indicates the possibility for a strong spring season. 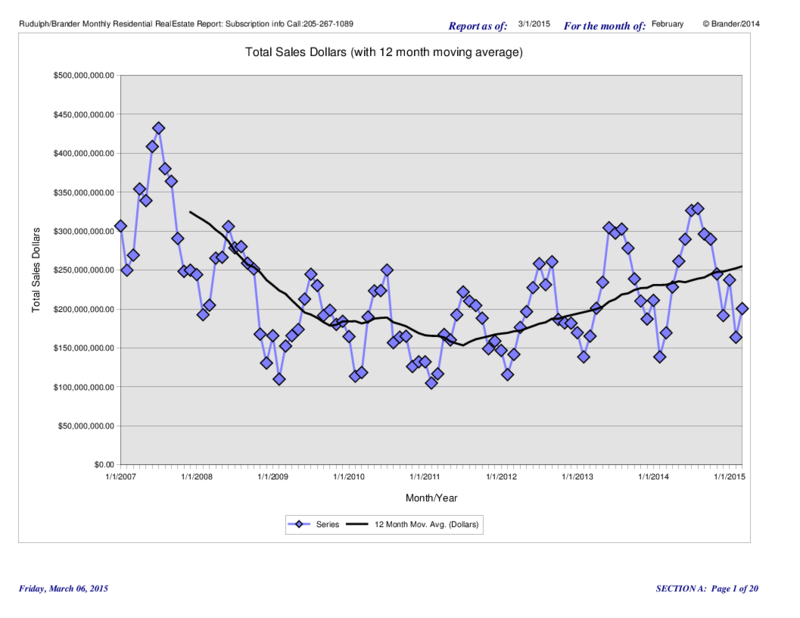 The 12 month moving average line for total dollar sales is continuing to show a very steady upward trend indicating consistent growth. Total Unit sales were up 13% to 1,047 in February from 926 in January, a increase of 121. This is up 6% from last February at 986. New sales increased by 7 units to 102 homes this month from 95 in January and off from 114 last year. Used sales were 945 homes in February, up 14% from 831 last month, an increase of 114, and up by 8% or 73 units from 872 last year(Sect E p.3). Keeping in mind the ACRE numbers are slightly different from those we report. With Acre, we released our 2015 forecast which can be seen here. We expect the Birmingham area to be 6% above 2014 levels. So this month’s unit increase of 6% is in line with the projection. Based on what I see I expect pretty substantial market gains. I also expect to see a healthy increase in new construction, the beginnings of which we can see from the year over year gains in permits below. This month total inventory is 1% lower at 9,359 vs. last month at 9,478 and 9,488 last year. The drop in the current month is caused by month-end expirations which should come back on the market. Active New listings decreased to 961 in February from 1,183 in January, a decline of 222 units (Sect E p.3). Housing permits were up in Jefferson County to 101 in January from 93 in December, which is up considerably from 65 last year. Shelby County went from 41 to 39 in January, up from 5 last year. It seems that builders are anticipating a strong spring market and I think they are right. In addition, we are seeing a more significant number of multi-family construction units (which we do not formally track or report) in most markets. Absorption for Used homes in February shows 7 months, one month better than the 8 months last year. Used Active listings at 8,398 are up slightly from last month at 8,295 and lower than the 8,666 last year (Sect E p.3). Market performance is highly area specific, so check the individual area charts. For instance, Mountain Brook has about four months of inventory except in the over $900,000 category, which has 7 months of inventory (36 homes), with six sold in that price range last month . The average days on market for that category is 131. There are a number of MLS areas showing similarly low levels of inventory, including Homewood and Centerpoint. Birmingham area Average Days on Market for New houses is 209 compared with last month at 112. The Used homes DOM was 131 in February vs 130 last month, (Sect A p.18). Average sales price for Sold New homes increased to $304,125 from $294,532 last month (Sect A p2). Average sales price for Sold Used homes increased to $179,410 from $163,404 last month (Sect A p2). The moving average price for all homes has been up steadily for the past year. (Sect A p2). This entry was posted in Absorption, ACRE, Alabama Center for Real Estate, Birmingham, Forecast, Home values, Jefferson County, Monthly comments, sales forecast and tagged Birmingham Alabama, Housing Statistics, Monthly comments, Residential Real Estate on March 13, 2015 by Tom Brander. Good to see such promising numbers, and hopefully a sign of good things to come in 2015.